BCS Edinburgh Branch programme: 08/04/15 - Where are all the Girls? Wednesday 8th April 2015, 6:30 pm. Speaker: Dr Hannah Dee, Aberystwyth University. working ... are we wasting our time? Dr Hannah Dee is a senior lecturer in computer science at Aberystwyth University. She runs the UK's main event for women undergrads and MSc students (the BCSWomen Lovelace Colloquium, now in its 8th year), and she's been on the committee of BCSWomen for nearly a decade. 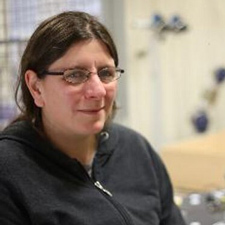 Her research is in computer vision and artificial intelligence, and before Aberystwyth she held researcher positions in Leeds, London and Grenoble (France). She's also interested in teaching computing to schoolkids, and has written workshops aimed at kids which use AI, robots, wearable tech, and android programming.